Language of obligation: Widgetco shall invoice Acme monthly in arrears for purchases under this agreement. That doesn’t make sense, as it suggests that Acme could bring a claim for breach if Widgetco doesn’t invoice Acme monthly. Language of discretion: Widgetco may invoice Acme monthly in arrears for purchases under this agreement. That’s not right either, as it suggests that each month Widgetco might say to itself, Yes, Acme owes us money, but do we really want to issue an invoice this month? Instead, invoicing is a matter of routine. Language of policy: Widgetco will invoice Acme monthly in arrears for purchases under this agreement. Nope. Language of policy (using will) is for stating the ground rules of a contract—stuff that is or will be, without anyone’s intervention. By contrast, invoicing requires party action. Language of obligation used to express a condition: For Widgetco’s invoices for purchases under this agreement to be valid, Widgetco must issue them to Acme no sooner than monthly in arrears. It’s cumbersome. And more to the point, it would be odd to have a condition to validity be the only way you address invoicing. Language of declaration: Acme acknowledges that Widgetco invoices purchasers of widgets monthly in arrears. Boom. It reflects the reality that Widgetco’s invoicing of Acme isn’t something unique to this transaction. Instead, it’s a function of Widgetco’s invoicing system. Of course, you won’t find a single contract that uses anything like this, but that certainly doesn’t worry me. 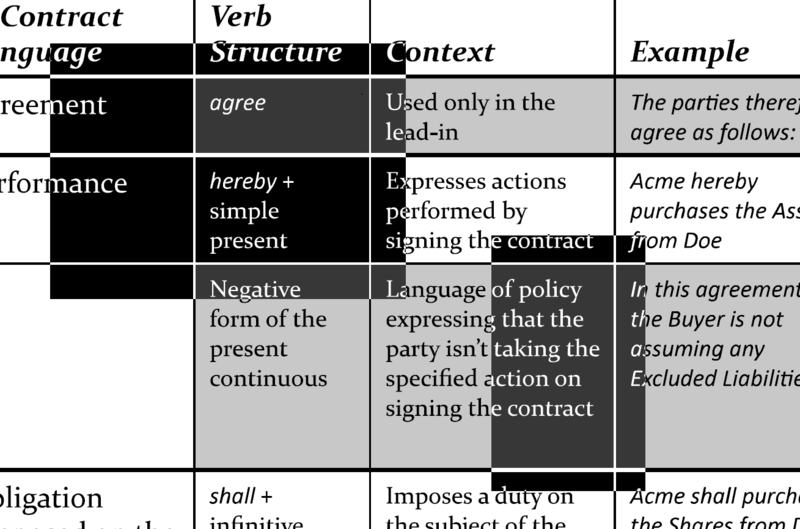 I signalled in this post that my task of compiling guidelines to the building blocks of contract language is largely done. But it will never be over, and here’s an example of that. As a general form of contract, this Agreement allows the parties to contract multiple projects or services through the issuance of Statements of Work without having to renegotiate the basic terms and conditions contained in this Agreement. This Agreement allows for up to three (3) shipping destinations per batch of Product. This Agreement allows a period of seven (7) days following Employee ’s signature on the agreement during which Employee may revoke this Agreement. RUTGERS understands and acknowledges that this agreement allows FIRM to disclose to COMPANY information otherwise protected by the attorney-client and/or work product privileges, which privileges shall be maintained and protected under the “common interest” doctrine. Why was I particularly pleased to encounter this agreement allows? Because This agreement allows Acme to is yet another messed-up alternative to Acme may. The fourth edition of MSCD lists in table 4 more than a dozen wordier and less-clear ways of saying Acme may. Spotting instances of this has been something of a hobby; see for example this 2017 post. I would have liked to have added this agreement allows Acme to to the list, but that will have to wait until the fifth edition. Whenever this Agreement permits or requires the Funds to give notice to, direct, provide information to State Street , such notice, direction, or information shall be provided to State Street on the Funds ’ behalf by any individual designated for such purpose by the Funds in a written notice to State Street. In this context too I’d use Acme may, as in If under this agreement Acme may. I don’t think anything is gained by limiting use of may to contexts where discretion is granted, but I’ll mull that over.